Courage is necessary for solving conflict. I’m sure this conversation took my friend outside her comfort zone, but her courage wasn’t what caught my attention. Rather, it was her overpowering selflessness. It was this selflessness that caused her to mention the topic in the first place. Having courage is only half the battle when approaching a difficult conversation. The other half is valuing the other person’s well-being above your own. During my internship with Kairos, I’ve recognized some trends in why people struggle with conflict. I’ve discovered that a lack of either selflessness or courage is the biggest obstacle. Someone lacking both of these traits won’t initiate conflict resolution or respond well to someone who does. Out of insecurity and pride, if we fall into this category, we may not see our own fault in a situation, but we aren’t brave enough to approach the person we feel has wronged us, either. 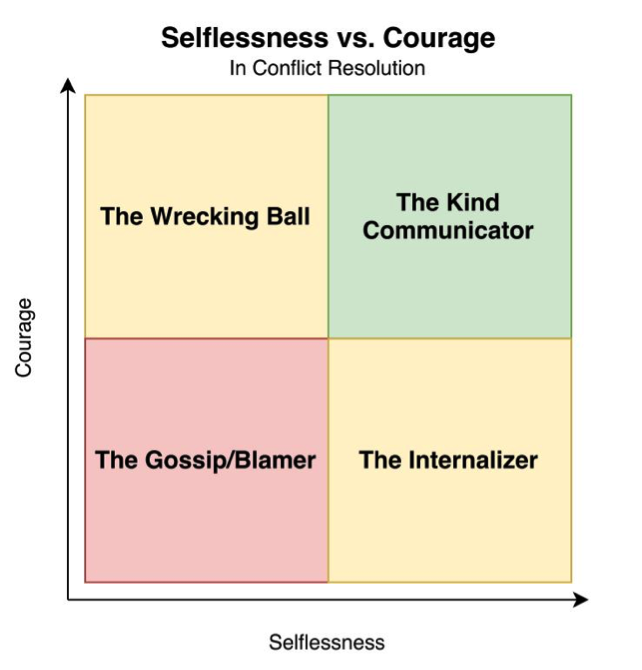 A selfish and cowardly person is a major concern for most people as they go into a tough conversation because of his or her tendency to respond defensively and resist change, whether this is verbally expressed or not. Sometimes we recognize conflict, but won’t address it. We bottle up anger, to avoid hurting others’ feelings. We may also fail to to start a hard conversation if we feel like we are at fault, too. There is great value in surfacing issues with the intent of patiently resolving them, even if it stings a bit. It is important to realize that while gentleness is valuable, it is selfish to let patience morph into a justification for giving in to fear. Presenting untruth to another, even when that untruth is fabricated peace, is unkind. If we have no fear to filter our words and are oblivious or careless towards the feelings of others, we are likely to damage relationships, leaving more splinters and confusion than necessary. We might boldly storm into a coworker’s office and deliver a verbal beating full of incorrect assumptions and unfair blame. While it is helpful that we can lay an issue out on the table, talking without considering the audience’s point of view is dangerous. Burying a point of contention isn’t healthy, but having some tact is. Finally, possessing both selflessness and courage enables us to handle conflict with maturity and wisdom. We can listen well enough to read between the lines and understand the intentions of others. We can minimize the damage our words have on the emotional wellbeing of those around us, without letting protecting someone’s feelings cause us to miss opportunities to push him toward long term growth. Ultimately, sorting out conflict, or “running to the fire”, saves enormous amounts of emotional energy and creates badly needed trust and vulnerability. After the previously mentioned talk I had with my friend, I was struck by the fact that that conversation, while a little painful, made me feel incredibly loved. If you’re struggling to start a hard conversation, take a step back and look at the big picture. When you take your own self-consciousness out of the equation and focus on the other person, it will be reflected in the way your listener interprets even the toughest of truths. Very well written! I have personally been at each of these stages during different times of my life (cringe) ! I find such wisdom and maturity in this piece that is impressive at such a young age! Kudos for your ability to look beyond a “criticism” and accept it for what it is…. loving concern from a friend and a change for personal growth! Thank you for your well written, concise and mature approach to a very difficult topic. Thank you, Kristina! I’ve spent some time in several of those categories already, too. It’s a humbling but so good to learn what it takes to grow! I appreciate your response and perspective. I agree. This is very well said. Thank you for providing the dealing-with-conflict matrix and easy to apply descriptions of each box. As an oft practicing Iternalizer I take courage from your words. Thank you Brent, I’m glad you found it helpful! Internalizer happens to be where I get stuck most often, too. Finding courage is really difficult, but so worthwhile! Very well put. Thank you for words to help me make a personal shift myself in the courage space. Thank you Sherri! I (and Kairos) wish you all the best as you make that shift. I’m glad you could relate. You were extremely brave in stepping out and sharing a personal learning experience. Your story and clarity, truly helps other to comprehend these powerful concepts. In addition, hopefully a few will modify their behavior based on this message.